This is the 3rd time that I've written this post. For some reason, it wasn't taking after I posted it. I'm going to do a test first to make sure it works before spending another hour writing and adding photos only to have it not take. I've written John and I came to the conclusion to use MS Internet Explorer instead of Google Chrome to see if that solves the problem. In a nutshell I'm rebuilding a layout in a new home in Louisville, KY that is 38' X 15'. Here's a picture. If this post takes, then I will write the full intro that I planned to do before. Well... that worked! Apparantly JC Archive doesn't particularly like Google Chrome. It's that or the fact that I was entering the new topic out of my profile, and not out of the category page. Regardless, let me tell you something about myself, my hobby orientation, and the currect project. I started out with Lionel in 1954 when my dad and I built a compact 13' X 4', all O-27. It was skinny because it was constrained by the room in the basement. At age 16 (1961) along came cars, guitars and girlsâ? ?in that orderâ? ?ended the time with trains. It didn't stop me from building models, which I even did in my dorm room at Michigan State, but trains didn't come back in my life until 1995 when the kids were out of the house and I cleared some of the basement in our home in Newtown, Pennsylvania. I was originally going to finish an n-gauge platform that my son and I were building before he left for college, but in 1995, I could no longer focus on n-gauge trains without wearing magnification. So I went out looking for HO when I discovered what happened ot my beloved O-gauge trains; they grew to scale size and had amazing sound systems. I was hooked. I bought an MTH Premiere GG-1 and a 3rd Rail Pennsy J1-a. This immediately locked me into large curves and I began designing a layout for Newtown. In 1999 I was asked by my company, Henkel, to come to their German headquarters and lead their global training efforts. It was an offer I couldn't refuse so my wife and moved to DÃ¼sseldorf, Germany. I negotiated a hard contract, which included that if I built a train layout in Germany, they would pay to pack and ship it back to our US house at the end. They agreed. 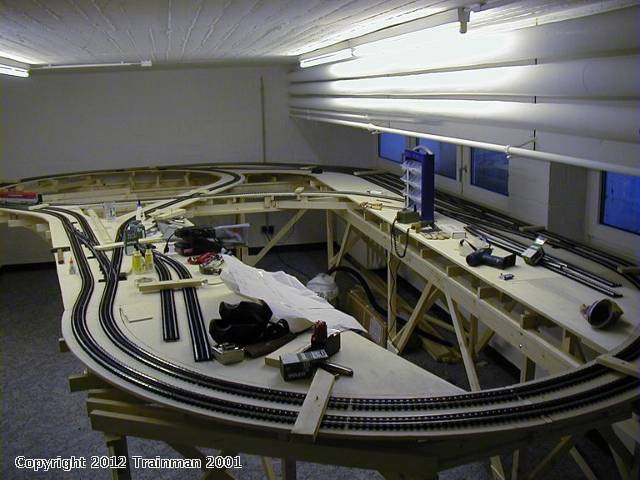 The German layout was 21' X 13' and fit nicely in a warm, dry basement room that was 28 X 13. It had all Ross track (which was smuggled to Germany in Dufflebags) and O-88 and O-96 curves. It had an outer and inner loop system connected by #8 Ross mainline switches. It was driven by my Z-4000 transformer through a 28 block cab-control system which relied on lots of DPDT switches and pilot lights indicating which transformer control was in effect on each block. When we moved back to our Newtown house in 2002, I assembled the layout in the basment which fit, by design, since I knew it was going to have to fit, and then added 6 feet to the length. This layout worked, but had some operational problems. The 4" center-to-center separation is too tight for the 3rd Rail H-8 Alleghency (my pride and joy) especially when it's running on the inside and long-length cars are on the outside, plus the yard area is unreachable. I also had a mainline crossing cutting a yard siding in half making it difficult to store intact trains there. 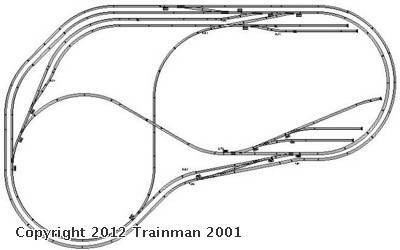 Lastly, the layout was wired with a ground loop system which, when I tested it, seemed incompatible with MTH DCS. From 2005 until the housing collapse in 2008, I was working with Toll Brothers, one of the Nation's largest home builders, but in Jan 2009 I was laid off at age 64. Not imagining getting a six-figure job any longer, my wife and I had a decision to make. To stay in Bucks County, PA meant selling the house and downsizing (read "goodbye trains"). Meanwhile our daugther and family were living in Louisville, KY where her husband was a surgeon. She has two boys, Alex 11, and Jack 8, and thought of being closer to all of them was very interesting. So we sold our house and moved away. The Louisville house was significantly less expensive while being larger and more luxurious at the same time. And the basement was 50% larger. We're only 3 minutes away from the family which is fantastic. 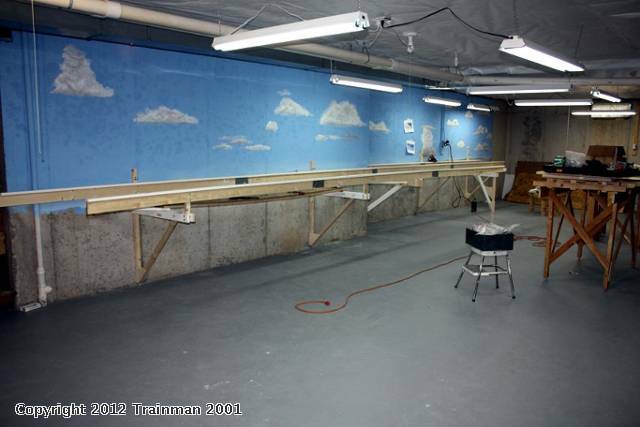 The basement is dry, has a large space without obstruction that over 46 feet wide and 16 feet wide. There are lally columns, but they're off to the sides. I enlarged the layout in both length and width, solved the operational problems and gave myself much more room for scenery and structures. I love to build structures and am a world-class model builder. The new layout is designed for DCS/TMCC/Legacy. It has a similar shape to the old ones, but will be more interesting. It will have an elevated portion reached by a <2% grade on both ends. There will be three bridges connecting the back to the front on the left end. The layout is entirely L-girder, and has a gazillon risers. I was able to incorporate ALL of the structural elements from the previous two iterations, and then add a whole bunch more. All told there's another $500 for lumber and about $1,300 for track. I made a deliberate decision to scrap all the playwood subroadbed and Vinylbed roadbed since I knew I was changing the layout and it cost $50/100 lbs to move that stuff. But I did salvage all of the L-girders, Joists and risers of the previous layouts. Some of the braces still have German price tags on them. On the long back wall, I chose to use angle brackets to support the girders so there would be no legs to block access. I'm holding the upper end to the wall with 1/2" wedge anchors and the bottom with Tapcons. All of the stress is on the top and the wedge anchors have a 4,000#+ pull out strength. This layout's not going anywhere. I painted the wall parts that will show a sky blue, and then taught myself to paint clouds. They're passable, not great, but the kids like them. I also decided to use OSB instead of ply simply to reduce cost. It's as strong as ply, although it does give "instant splinters" if you handle it without gloves. I'm using leather work gloves whenever I working around this stuff. All joists are on 16" centers. In the lower right corner there's going to be a swing-out door that will permit easy access without a duck-under. I'm getting too old for duck-unders. The door will be suspended on large fixed casters and pivots on a 30" piano hinge. I'm still working on the latching system, but purchased a chest lock with a bail that will pull it tightly closed. Dale H is helping me put together a relay-based interlocking scheme that will immediately cut power when the latch is released and will turn it back on when latched after an adjustable time delay. I enjoy soldering and building, so this should be fun. I authored an article in Classic Toy Trains in February 2002 on soldering lead wires to rails. It was a cover story. In the 70s I taught about 1,000 people to do precision industrial soldering. I'm going to submit another post discussing the structures that will be going on this layout. Wonderful layout, and thank you for joining us and sharing. Google's Chrome browser is still very new (compared to the more established browsers like Firefox, or Internet Explorer), and so there are quirks with it from time to time. I'm sure they will improve it with time. The Archive is established to retain everyone's content for posterity, and also to be able to organize the content into categories. This makes it much easier to find what you are interested in, and also helps the search engines (Google, Yahoo, Bing) to index our content, so that outsiders (and ourselves) can easily find things in the Archive by typing in keywords into the search engines. 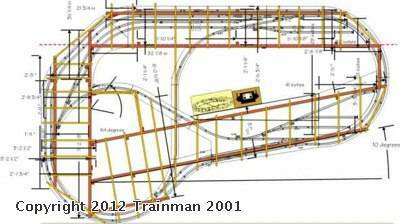 Looking forward to more stories from you Trainman 2001! Very nice layout! The inside figure 8 and many switches will create interesting action while the large radius curves will help with the Allegheny and other large locomotives and/or passenger trains! Glad to be part of the Archive! I'm now gluing track and Flexibed into place using structural adhesive. I'm about 1/3 complete. My grandson is helping whenever he can. 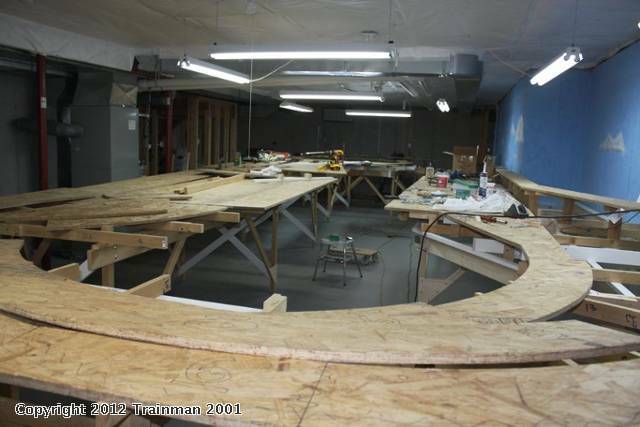 We're even super-elevating some of the big outside curves using a 20 gauge wire under the outside track edge. It looks nice when a passenger car leans into the curve. We tested it with some rolling stock and it works. I'll post some more pictures when this phase is complete.